“The kids love the Batman! They love the gears and the steams and the punkiness! They also love mashing things together!”—someone, somewhere at Square-Enix, before deciding to unleash this wonderfully insane action figure onto the general populace. 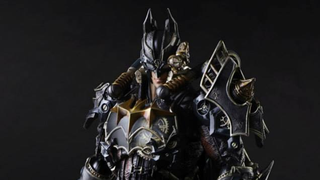 Yes, the DC variant line from Play Arts Kai that has already given us Cowboy Batman and Giant Demon Dragon Oh God What Batman is continuing with “Batman, but this time with COGS AND GEARS” Batman, better known as Steampunk Batman. Steampunk Bats has made the con circuit for a good few years at this point, but this is actually our first official look at the figure, and it continues to look wonderfully, egregiously bonkers. Concertina cape for flying? Monocle? Superfluous gears everywhere? Victoriana spikes thrown in for good measure? Yup, this sure is steampunky. Yet, it’s quite much more Batman than it is Steampunk in a way, especially in the colour scheme and materials. There’s no leather to be found here, as the 7-inch scale Batman is practically all armor. Sadly Square-Enix haven’t revealed any pricing or release details for the figure yet, but expect a hefty Batman-Tax on top of the usual price—previous figures in the line have retailed for around $100.